Wow Bonkers. How do you do it? A wonderful picture. Just had to nominate this one and put on favourites. How lovely is that? They are so beautiful. 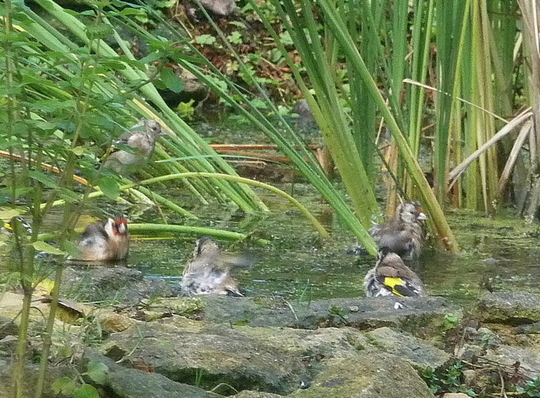 You dont only get them feeding in your garden, you get the bathing too! Fantastic picture BB what a wonderful sight, on my favourites right now! Thanks for kind comments ..they are lovely birds and so tough , the worse the weather the better they seem to like it ..a bit fuzzy as weather drizzly . The bird on the left Morgana is a recent fledgling hence no red markings. The one on the right slightly older as you can see red develop just above the beak. Thanks Toto a compliment indeed given the great close ups you manage to get. We have a bullrush in the pond and they love to hang on to the stems ..looking forward to doing the same on the teasels you sent Dawn ..growing well. What kind of feeder, Sid? Thank you Bonkersbon I will watch out for that this winter as I get lots in my garden and Bullfinches too. Another great pic BB. Love that, it looks like a bird day out. Great that you have so many Goldfinches. Mad - a niger seed feeder (least i think that's how it's spelt lol) It's a clear plastic tube with tiny holes that fit their beaks and you fill it with niger seed, which I believe is just thistle seed really, so I'm not sure why they call it that....... Anyway, they are meant to be ideal for goldfinches. BB you have done it again, well done so lovely to see so many in one place. Thanks for kind comments .. when moved in 2 years ago just the odd goldfinch visited. Being on east coast knew that siskins often over winter here and might get to see brambling with them . You quite right Sid no connection between thistle and nyger seed. Plants not related other than seed very similar in size and shape. As nyger seed from Africa a y was introduced to its spelling as some were mis pronouncing it and asking for it by a quite offensive term. Although nyger seed more nutritious thistles remain beneficial as the soft seed spores often used to line nests.Have even seen a goldfinch cling on to groundsel weed to pull out the tufted spores for nesting material. Super photo, they look like they are really enjoying their bath! Great photo, you are so lucky in your guests. I mainly get squabbling wood pigeons! :-) I wonder is that where the word squab (baby pigeon) comes from? Thanks all.Lincslass...so pleased you will have better views of your visitors ! What a delightful sight to see ! Another great shot of nature at it's finest. Keep 'em coming ! Thanks Flower .. that son of yours letting you back into your garden yet ? No...,.not yet ...lol. I snuck into the computer room for a minute of solitude. I better run before he notices I'm gone, or it will be double time for me...lol ! Even running to the computer ? Thats dedication for you ..just imagine how much faster you ll be able to garden ..look forward to twice as many pics from you soon .. all this fitness you wont need such big leaves to hide behind ..
What amazing photos you have and how lovely to have all that wild life, especially the birds, unfortunately my cat is a bit of a hunter and so Im torn this winter about whether to feed or not in case it does more harm than good. Thanks RR welcome to Goy ..if you have a bird table and hanging feeders these should prove safer than ground feeding birds . We have a Sparrowhawk that often visits and wonder sometimes whether it right to encourage birds to feed but then opportunities exist in many places and feeding esp during winter helps far more than those that are lost . :-))) Good one Bonkers/Jane ! Hehe, you have quite a memory too..... May go with fig leaves next year...lol. Do I dare....? Ah yes, my sweet Toto, I should go and visit his site. It has been a while since I've had the pleasure...;-) Never did get to see the inside of his shed !